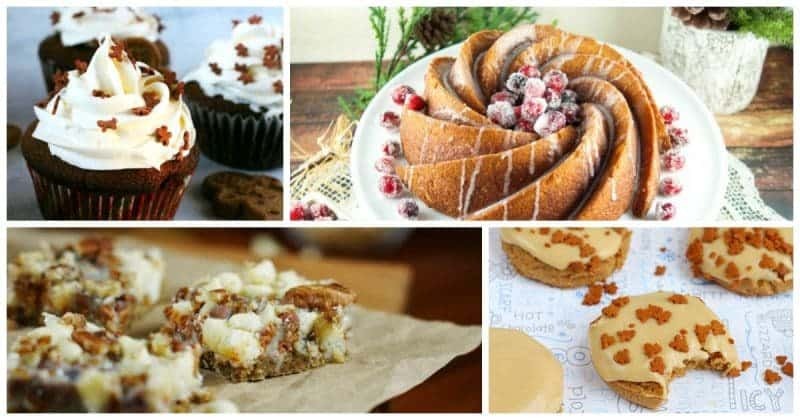 If you are searching for the perfect gingerbread dessert to make for Christmas this year, you will love these 15 festive gingerbread recipes. From gingerbread cookies to gingerbread cakes and cupcakes, there is something here for everyone. If you are at all like me, you will have a hard time narrowing it down to just one recipe, and will likely want to try even more! This moist gingerbread roll cake has a delicious creamy filling that is sure to please. A festive variation of the traditional 7 layer cookie, these gingerbread magic cookies are simply the perfect mix of all things yummy. This super moist gingerbread bundt cake, topped with a sweet vanilla glaze, is perfect for dessert or brunch. What would Christmas be without a gingerbread house? Ditch the kit you buy at the store and build your gingerbread house from scratch this year. Filled with a lemon cream cheese filling, these gingerbread blondies are easy to make and perfect for a last minute holiday treat. These gingerbread cupcakes are moist, flavorful, and adorable to boot! These soft gingerbread cookies are topped with a sweet brown sugar molasses icing for a delicious christmas dessert. If you are a total sucker for cream cheese icing like me, these gingerbread cookie bars will be right up your alley. This gingerbread latte is the perfect holiday drink for coffee-lover at Christmastime. There is nothing more indulging than a nice piece of fudge. This gingerbread fudge recipe is the perfect treat for this time of year. This sweet and sticky gingerbread monkey bread would make the perfect Christmas morning breakfast or dessert. Another recipe perfect for coffee-lovers, this gingerbread mocha can be make right in your slow cooker. Okay, I know what you are thinking, pancakes aren't dessert. But these gingerbread pancakes are so delicious you will want to eat them for Christmas morning breakfast as well as again for dessert! Use this recipe to make the perfect gingerbread men cookies, then let the kiddos decorate their gingerbread men how ever they want for a fun Christmas activity. This trifle combines gingerbread, egg bog mousse, and a cranberry coulis for a perfect Christmas dessert. 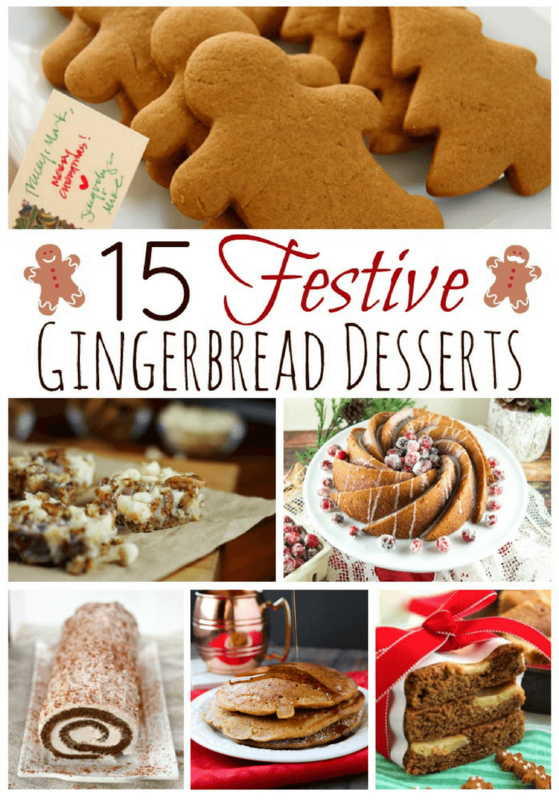 I hope that you find your perfect gingerbread dessert recipe to make for Christmas this year. We would love to hear about your favorite gingerbread desserts in the comment below. This is great! I love gingerbread. We made gingerbread houses this year for Christmas… although I admit I used graham crackers. Oh how I wish I had seen this before Christmas! I will definitely save it for next Christmas! Thank you so much for all the great information! I must try that Gingerbread Spice Monkey Bread recipe! It looks so tasty! My daughter’s been craving ginger bread this year, so thanks for the recipes! All of these gingerbread recipes sound amazing! I particularly want to try making the Gingerbread Roll Cake first, this is something that I have never had before! It looks delicious! 🙂 Thanks for sharing! Gingerbread is a favorite – Id love it all year! Thanks SO much for the post! I am always looking for good Gingerbread recipes and the Gingerbread Bundt Cake with Vanilla Glaze – Living Sweet Moments looks and sounds especially yummy! !